President Hage Geingob is impressed by the relationship between Kenyan president Uhuru Kenyatta and the country's opposition leader Raila Odinga. 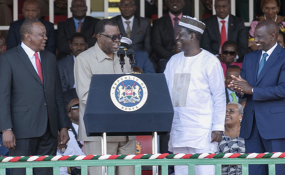 Geingob who was in Kenya at the invitation of Kenyatta revealed his gratification to a fully packed stadium during the Mashujaa Day (Heroes Day) celebrations in Kenya's capital, Nairobi. "My aim was to bring greetings, but after what I have seen here, I am touched. Firstly, I believe in saying that inclusivity spells harmony, exclusivity spells conflict," he said. "Today I am standing here as a very proud African to have witness my brothers here [Kenyatta-Odinga] both of them that I know very well, today my speech will just be to invite them to come and stand here," said Geingob who had put his official speech aside. "My whole speech is ending here, the other one I will distribute," said the visibly ecstatic Geingob in a YouTube video. "What I have observed here, "Since I came to Kenya, to see what I have seen on television that two brothers said he is my brother and they hugged... I did not believe it, now here it is, congratulations my brothers," he said as he turned to Kenyatta and told him, 'you are leading', and to Odinga 'you are a revolutionary'," said Geingob. In his official speech, which he did not deliver, Geingob announced that he has bestowed the Most Brilliant Order of the Sun on Kenya's Retired Lieutenant General Daniel Opande, the UN's Mission in Liberia first commander. "When the rest of the UNTAG force departed, our Founding Father, comrade Sam Nujoma, made a brotherly appeal to President Daniel Arap Moi, for the Kenyan Blue Helmet Contingent, under the leadership of Lieutenant General (rtd) Daniel Ishmael Opande, to remain behind for three months, to help maintain stability, at the cost of the Kenyan government," said Geingob in his statement. He added that it is for this reason that the Namibian government has decided to award "this brave son of Kenya" with the second highest honour, which he will receive at an appropriate time. Geingob said Namibians are grateful for leaders such as Kwame Nkrumah of Ghana, Ahmed Sékou Touré of Guinea, Gamal Abdel Nasser of Egypt, Julius Nyerere of Tanzania, Jomo "Mzee" Kenyatta of Kenya, Ferhat Abbas of Algeria, Kenneth Kaunda of Zambia and Augustinho Neto of Angola. Geingob concluded the three day state visit to that country yesterday.